founded National Equestrian Communications in 1976. It provides public address systems and announcing to equestrian competitions in America from Olympic Games to local pony club rallies. 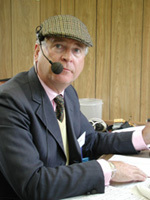 From behind the microphone, Nigel has been closely involved with event management for over 40 years from Olympic Games, World Championships, World Cups and national championships in the international disciplines of eventing, dressage and driving. In 1984, he added steeple chasing to his repertoire, including providing sound to four of the five Grade 1 stakes sanctioned by the National Steeplechase Association in the United States hosting spectators in excess of 70,000. Alexandra Mennell spent the first nine years of her career in London working in politics before moving on to work at the Arts Council of Great Britain for five years, covering all aspects of the Arts, but particularly fulfilling her love of the theater. 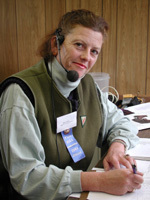 Since moving to the USA in 1995, she has worked for National Equestrian Communications as assistant announcer and with Nigel Casserley designs and prepares temporary public address systems at equestrian events throughout the country. Alexandra was the French announcer at the test event for the Atlanta Olympics in 1995. She has also announced in French for the Bromont CCI* and CCI** in Canada on several occasions. Alexandra is currently the spokesperson, secretary and treasurer for Days In The Country (DITC) Environmental Education Foundation, Inc., which is based in Virginia.